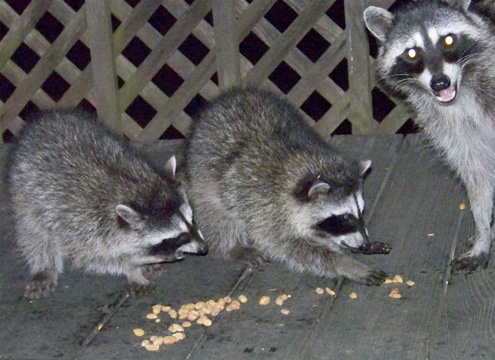 A mother raccoon guards her two kits while they eat peanuts (cacahuates) off my deck. 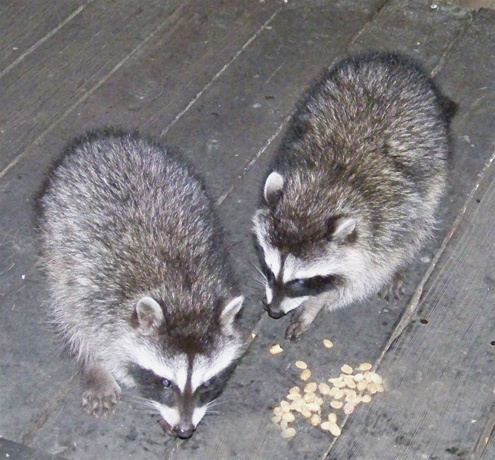 My former wife Ana Carolina in Guatemala refers to raccoons as “mapaches,” which is the name the Spanish colonists gave them. The word was taken from the Nahuati word “mapachitli,” meaning “one who takes everything in its hands.” Nahua was the language of the ancient Aztecs and is still spoken in Central Mexico. 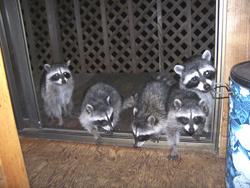 The English word “raccoon” comes from the Virginia Algonquian word “aroughcun,” which is also spelled “arathkone.” The language, a subgroup of the Algonquian language, died out in the 1790s. 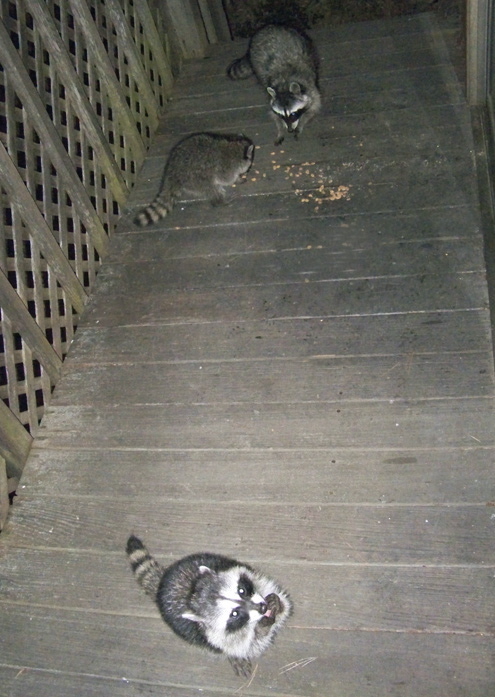 The kits are are far less skittish around me than their mother is unless I make a quick movement. Historical curiosity: The first written description of raccoons was made by Christopher Columbus, who in 1492 discovered them on his expedition to the New World. Many fledglings after first leaving the nest want to be fed as if they were still in it. 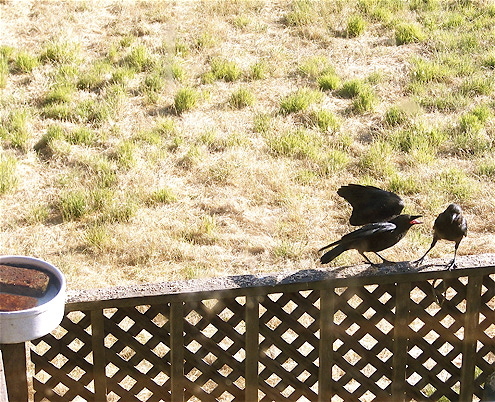 On the railing of my deck, this young crow (“cuervo” en español) caws incessantly and holds its mouth open in hopes the parent will feed it birdseed — even though the youngster is standing in birdseed. Crows are smaller than ravens although at a distance it’s hard to gauge their sizes. The most obvious difference is in their tails when the birds are in flight. The tail feathers of a raven form a wedge shape while the tail feathers of a crow are almost straight across. 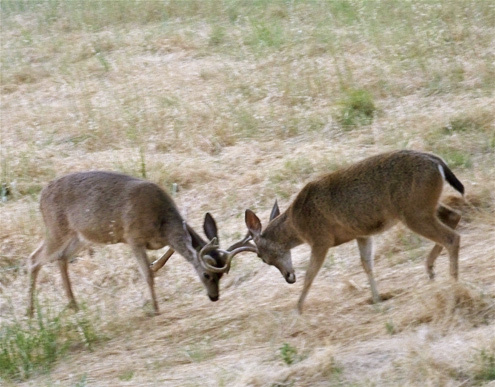 Young bucks sparring next to my cabin. 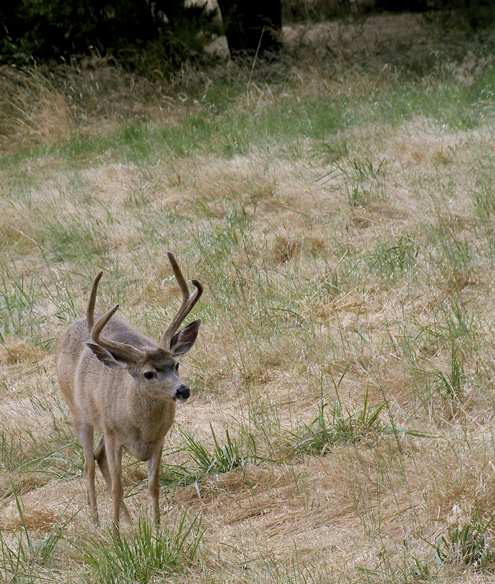 These young blacktails are not trying to hurt each other but to establish dominance. 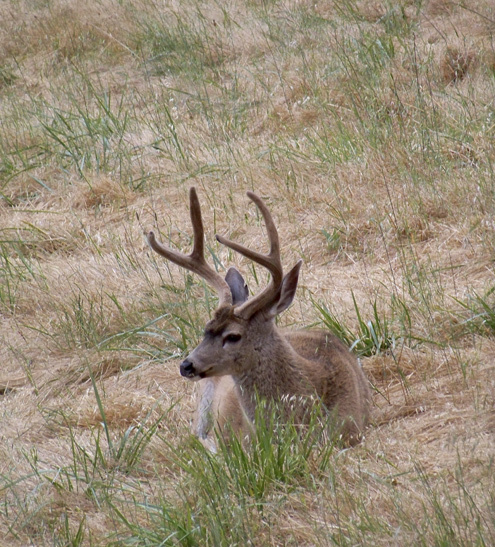 Does prefer to mate with the stronger buck. 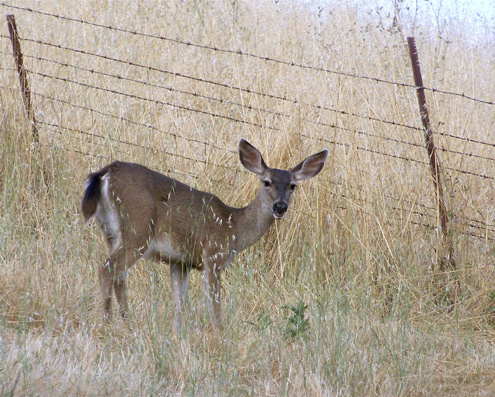 From an evolutionary standpoint, this passes along the genes of the hardier deer (“venado” en español), which helps ensure the survival of the species. Así que ahora ustedes tiene la lección de esta semana sobre los mapaches, cuervos, venados y la lengua española. Estudien mucho y no gasten dinero en Arizona. As many West Marin residents recall, Linda Petersen, ad manager of The West Marin Citizen, was severely injured a year ago when she fell asleep at the wheel and hit a utility pole in Inverness. 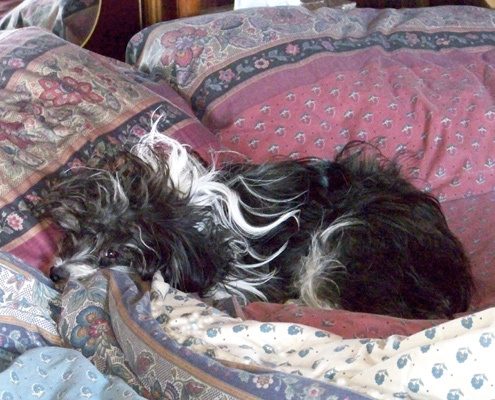 Her popular little Havanese dog Sebastian died in the crash. Linda suffered 11 broken ribs, a tear in her diaphragm, a collapsed lung, a broken neck, two fractured vertebrae, a broken wrist, a shattered femur, a fractured kneecap, and two broken ankles. She was hospitalized for three months, and last October a community fundraiser was held to help pay her medical bills. 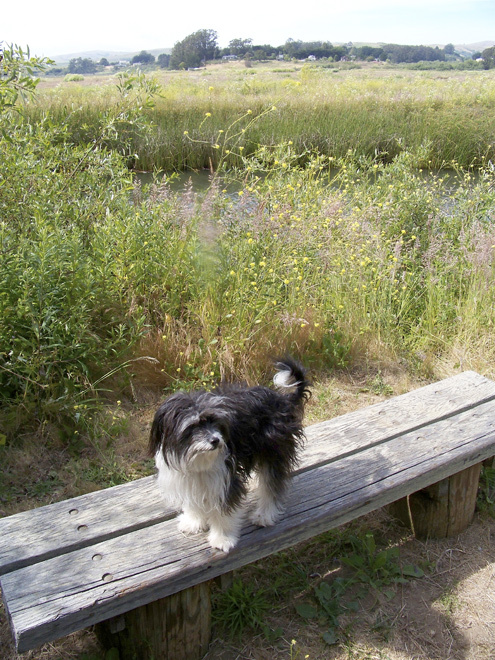 In January, Linda got a new Havanese from the Marin County Humane Society and named him Eli. Sebastian had been 16 years old and was slow getting around in his last couple of months. Eli, however, is only 19 months and still puppy, as I learned all too well during the past three weeks when Linda left him in my care while she visited her mother in Sweden. 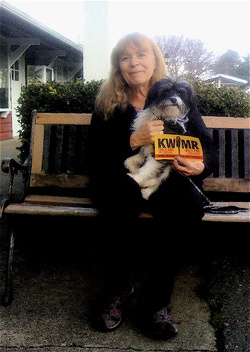 Linda with Eli in a KWMR listeners’ pets promotion. I had taken care of Sebastian from time to time when Linda was away. Usually I was scarcely aware he was in my cabin. Eli’s stay was totally different. 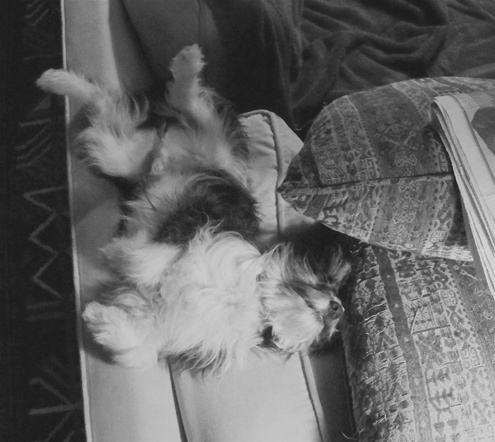 If he didn’t get at least a couple of long walks a day, he pooped indoors (this happened three times) or peed (once). Worse yet, it was never on a wood floor but always on a carpet, which probably reminded him of grass. Eli has a number of toys and likes to play fetch, but sometimes he lightly nips the people playing with him. I discouraged this but didn’t worry about it. My guests were merely patient. Neighbor Jay Haas was visiting a couple of weeks ago when Eli drew blood while playing with him. Some of Eli’s antics were both comic and irritating. While sitting on my couch, Nina Howard of Inverness tried throwing toys for Eli to fetch, only to find that when he returned with them, he often jumped onto the couch and stood on her bosom with all four feet. Eli’s a small dog, but this was too much for Nina. Eli sleeping while balanced on the back of the couch. But it was his puppy-stage chewing when unattended that gave me the most problem. 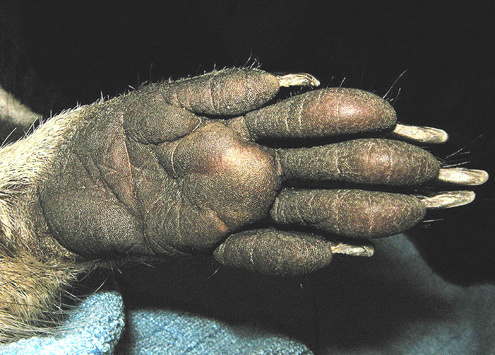 He chewed on a couple of houseplants, one of which was a philodendron. Unfortunately, philodendrons are poisonous for dogs and people. The plant can cause lips to burn and throats to swell, so when I caught Eli chowing down on a vine, I had to hold him over a sink, pry his mouth open, and run water through it. Boy was that a struggle! 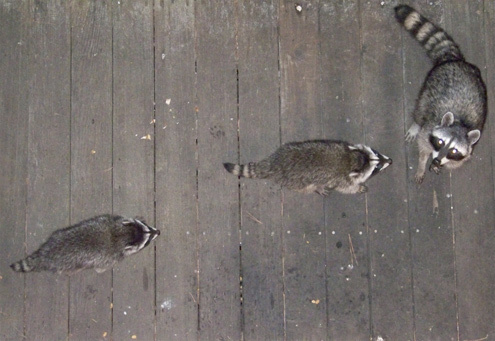 The time I became most concerned for his well-being, however, was the night he spotted a raccoon on my deck, slipped out the kitchen door, and took off into the dark after it. Luckily the raccoon chose to run rather than stand its ground or that could have been the end of Eli. When Eli became too exuberant, I initially tried to distract him with chewable dog treats, but that proved to be a terrible idea. Rather than chew on them, he tried to “bury” them — in corners of my loft, behind furniture, or in the furniture itself. I was more than a little annoyed when I discovered that in digging a hole to bury a treat, he had shredded a quilt covering a futon. Eli at White House Pool. 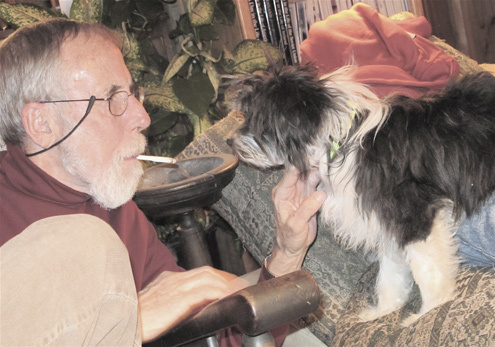 Eli and I quickly became buddies, and I liked having him sleep on the bed beside me at night. He was too small to get in my way, and often he’d affectionately nuzzle me under the chin before falling asleep. During the day, he followed me from room to room, and I took him with me in the car everywhere I went. This, in turn, led to an unexpected encounter at The Point Reyes Light. Last weekend, the Jack Mason Museum held an opening for an exhibit on Jack, who died 25 years ago. Dewey Livingston of Inverness, who has taken over Jack’s mantle as the historian of this area, had suggested I write a profile of Jack in advance of the event, and editor Tess Elliott had said The Light would like to publish it. On a hot day three weeks ago, I dropped in at The Light to check its clipping file for stories I’d written over the years about Jack. Because of the heat, I didn’t want to leave Eli in the car, so I brought him in with me on a leash. MMI had this day fired back with a dismissive rebuttal, but The Light staff’s feelings were still too “raw” to have Eli in the office, I was told. To them he “symbolizes” the other camp, the staff said. I explained about the hot car but left. Later that day I was invited back to check Jack’s file, which I did and wrote an article that ran in The Light last week. I’m not criticizing the staff at The Light. Tess wrote me afterward that she felt bad about Eli, and I took the staff at their word when they said their emotions were raw at the moment. 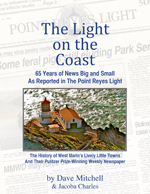 Indeed, MMI vice chairman Mark Dowie that week said The Light’s staff were catching hell from townspeople over board actions the staff had nothing to do with. Both Eli and MMI’s leadership need to exercise self-restraint. At least in Eli‘s case, he’ll be receiving training in this during an upcoming class at the Dance Palace. Sparsely Sage and Timely is powered by	WordPress 4.9.10 and delivered to you in 0.582 seconds using 48 queries.